Ready for a short squeeze? Is the CPWY short squeeze coming next week? One of my favorite type of swings trade are potential short squeezes. 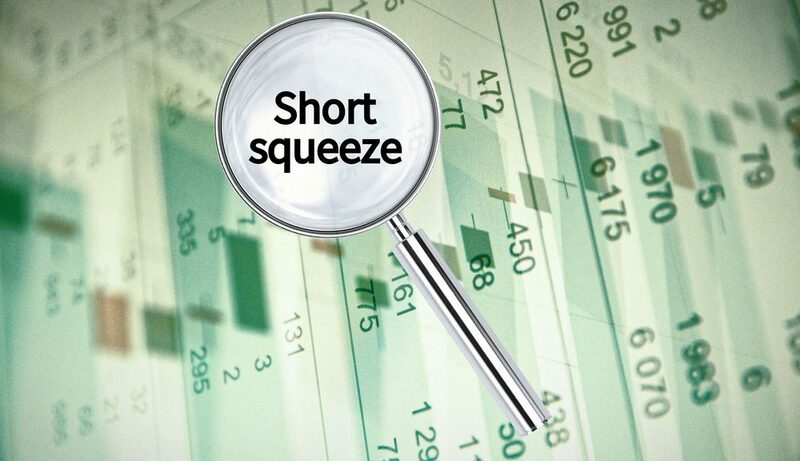 A short squeeze happens when a stock has a high amount of short interest, and increased buying pressure forces short sellers to have to buy back their shares at a higher cost. When a market maker opens up a short position that market maker is betting against the stock. When a market maker is short they are hoping that the stock goes down. This will allow them to cover or buy back the shares they are short at a lower price and they get to keep the difference in price. If a stock continues to go up and they are forced to cover or buy back at a higher price and they will lose money on the trade. If the stock in a thinly traded stock with a low float it may be difficult for shorts to buy back their shares. When they start competing to buy back shares and the stocks price continues to rise it creates a short squeeze. A Short squeeze can be more problematic for those who have a short position when a stock starts setting off margin calls for them and their brokers automatically start buying shares back on the ask. Short Squeeze are very good for those who bought a stock in hopes of it going higher! 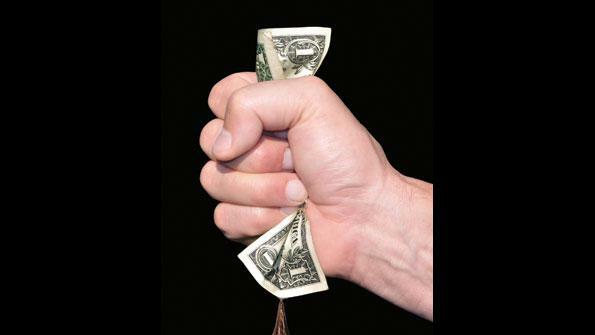 Penny stocks are loosely regulated which opens up the door to market manipulation. One form of manipulation is where market makers will naked short a stock. When a market maker shorts a stock they borrow shares. They borrow the shares and sell them into the open market. They then promise to buy back the same amount of shares at a later time. 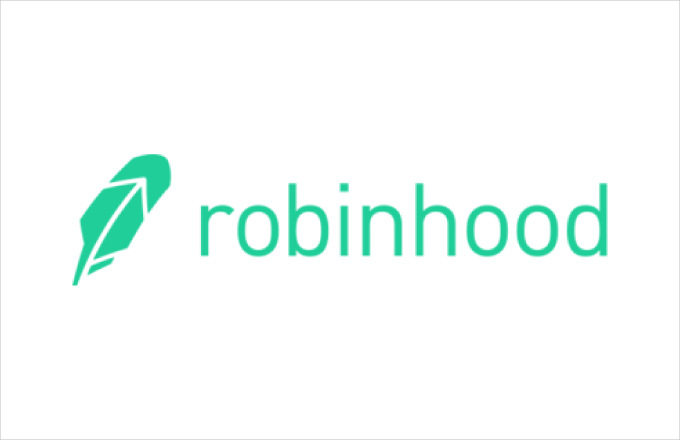 For example if Market Maker CDEL decided to short 100,000 shares of a stock that was trading at $1 a share they would borrow those 100,000 shares sell them at $1 a share for a cost of $100,000 plus a predetermined amount of short interest. Lets say that stock went down to .50 a share and CDEL decided to cover or buy back their short position, They would then spend $50,000 to buy back that 100,000 shares, and their profit would be $50,000 ($100,000-50,000=$50,000 profit). 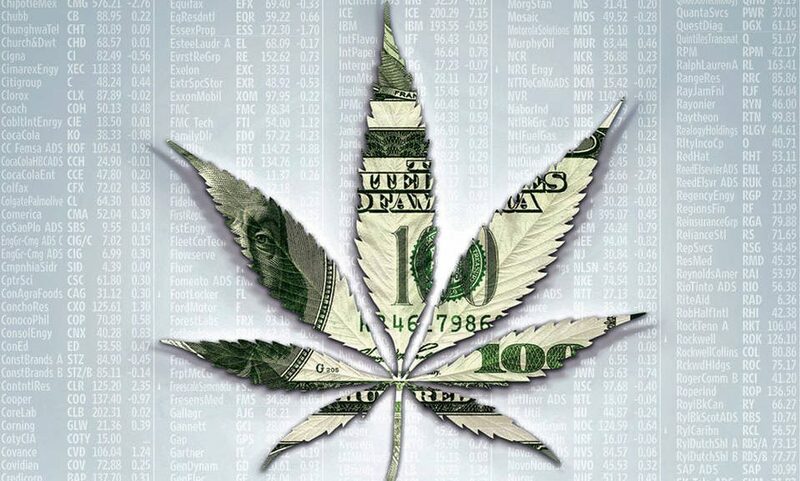 Now lets say the stock went up to $1.25 a share instead of falling. If the short seller CDEL had to buy back or cover at this price it would cost them $125,000 for the 100,000 shares. So they would end up losing 25k ($100,000-125,000=$25,000 loss). Now with penny stocks market makers are extra aggressive. They will do what is called naked shorting. The SEC allows market makers to take up to 72 hours or 3 trading days to find shares to borrow. It is called a naked short because they don’t have to actually have any shares available to borrow for up to the 72 hrs. After 72 hours has past they must either buy back the shares and cover or find available shares to short. Market makers got smart and found a loophole around covering their shares. What they would do is arrange secret agreements with other market makers. They would help cover each others short position. This allows market makers to extend well pass the original 72hrs. They can get away with this for up to 30 days before they have to cover all of their shares. They extend the time hoping the stock will fall in price before the 30 days are up. 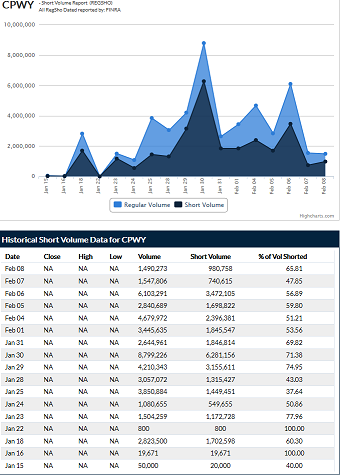 Let’s take a look at the high short interest in CPWY. Why I am so excited about CPWY stock is that there currently is zero diltuion and a huge amount of short interest. Over the last 15 days there has been 26,761,654 shares shorted. That’s over 26 million! and according to my calculations the majority of those shares still need to be bought back and covered. Right now market makers keep doubling down hoping they can scare out retail buyers into selling shares and they keep adding to their short position. If retail buyers hold strong and not get tricked I believe in around 15-20 days CPWY could see a massive short squeeze sending the stock price skyrocketing! The OTC has seen a few nice short squeezes lately. One was VYST which went from .0006 to .06 which was over 10,000% and another one is SHMP which was at .005 and has went over .60! I believe CPWY could be next! The most difficult part is not falling for market maker games. They are good at what they do. They will make it look like there are huge sell offs. They will stack large sells on the ask, They will create large spreads and they do this to try to discourage people from buying and to try to trick people into selling. I have been fortunate enough to make a lot of money in stocks by noticing these Market Maker games and having the patience to avoid their tricks. UPDATE: Is the short Squeeze coming next week? As you can see by the short volume right around the 30th there wsas huge volume! That would make it possible for a huge short squeeze coming to CPWY in the very new future!